These WolfPack™ Preconfigured SDI Matrix Switchers are the perfect device for 3G-SDI, HD-SDI and SDI distribution applications when you need the highest possible video signal quality. They are made up of a 36x36 modular matrix chassis and SDI cards of various quantity to give you the number of SDI inputs and SDI outputs you require. You can control the SDI Matrix Switcher via its iOS or Android app, a few simple button taps from the front panel buttons, a WEB GUI Browser control or the RS-232 serial port. These SDI Matrix routers meet all the quality SMPTE and ITU standards to deliver standard and high definition SDI videos. You can easily switch between multiple serial digital video (SDI) signals and embedded audio for excellent AV presentation applications, small video productions and post-production systems. 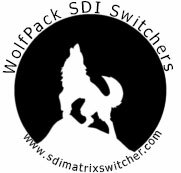 These WolfPack™ Preconfigured SDI matrix switchers allow any input to be routed to any output; or the same input to be routed to all outputs, or any combination. They are cost-effective and provide an excellent SDI matrix switcher solution for applications where budgets are at premium.